Eastern Uganda that stretches from Jinja up to the arid landscapes of Kidepo Valley National Park is one of the rich havens that have got great Uganda safari products with the potential to attract counts of world travelers to undertake safaris to Uganda. Jinja lying on the eastern side of the mighty Nile River and a the home to its maiden source has a range of adventure activities like the famous bungee jumping, quad biking, white water rafting and the newly unleashed Kagulu hill whose adventurous hiking challenges have prompted even the local Ugandans to try their luck. The region of Eastern Uganda is also a home of the Sipi falls with is beautiful Uganda safari tour feature that flows romantically in three separate falls in the district of Kapchorwa, Sironko and Mbale close to the other mighty feature – the Elgon Mountain 4321m which is the largest the largest Mountain Caldera in the whole world and the largest Volcanic base on the same scale. The Mountain boasts of its ancient position as the highest mountain in Africa before it lost its status to number eight and number four in East Africa as a result of forces of erosion. 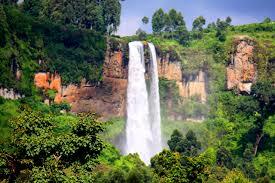 The mountain is among the commonly toured sites by travelers on Uganda safaris and tours. Other remarkable features in the mid-eastern Uganda include the famous Tororo rock which is positioned at 5km distance in the east of Tororo town, 48km from Mbale and the distance of 210km from Kampala. The Busitema Forest with lots of primates, tree species and birds and the rich cultural heritage encounters such as the Imbalu circumcision ceremonies among the Bagisu whose festivity has always pulled a number of travelers to come on a safari in Uganda to attend it. In the Far East, there lies the protected areas of Mathenilko Bokora, Pian Upe, and Kidepo Valley National Park with counts of unique wild life some of which is found nowhere else in the country such as Ostrich and Cheetah. These instant destinations have not experienced the full benefit for their natural endowment as the Uganda safaris to those areas have been limited due to cases of instability and poor infrastructure. At the wake of the time when everyone when the country is getting to realize the importance of tourism, the plight of the tourism potential in the greater eastern Uganda is beginning to gain ground. The hike to the Tororo rock is marked as one of these initiatives that would contribute to the mission. With the company of 27 Tourism beauty Queens, the Hon Minister Mutagamba as the chief hiker and other corporates participants not forgetting the UTB Officials, the hike of the Tororo rock has been more than just a hike and other people including travelers on Uganda safari tours could not be left out.